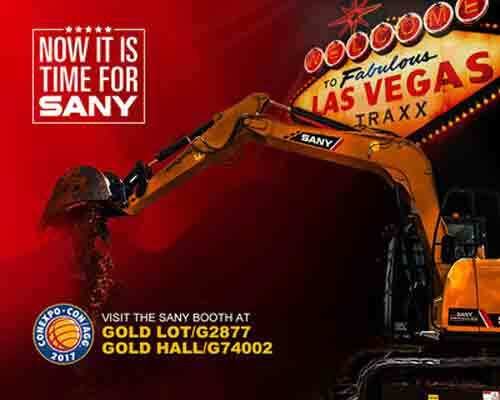 16 excavators are the highlight in SANY's booth. The SY26U is a brand new compact excavator that features zero tail swing and independent boom swing, enhancing productivity in extremely confined spaces. The SY235CLC is a medium excavator, known as the "King of Reach." It is equipped with an 18m long arm and Intelligent DOMCS (Dynamic Optimization Machine Control System), which ensures unmatched productivity with optimum fuel economy and superior hydraulic power. The large SY500H 50 ton excavator is the new flagship for SANY America. This machine was designed to comply with emission standards and transportation regulations in North America and Europe. The most exciting news is that SANY will offer a 5 year/5000-hour warranty and 0% financing up to 48 months for all of the excavators at CONEXPO 2017. The SMG200C-8 features a Tier 4F engine for high power and fuel efficiency, reliable direct drive and powerful shift transmission for quick response to operator input, and a load sensing hydraulic system to provide precise control. The rough terrain cranes, crawler crane, forklift truck and drilling rig are also SANY's star products worth visiting. They offer exceptional safety and reliability, guarantee comfortable and convenient ergonomics and significantly reduce emissions. In addition to the machines, a wide range of parts will be represented at CONEXPO, showing SANY America's ability to efficiently provide parts and gain recognition in local markets. Putzmeister, as a member of SANY Group, will also present a range of innovations and new products over an area of 20,800 square feet. The company will exhibit a new truck-mounted concrete pump with the 47z boom, in addition to three boom pumps, one telebelt, a placing boom system, and four trailer pumps, and also parts and used equipment. With the slogan "NOW IT IS TIME FOR SANY", SANY welcomes global customers to Booth No. G2877 in the Gold Lot and Booth No. G74002 in the Gold Hall at Las Vegas Convention Center, Nevada. With an exhibition area totaling 36,800 square feet, SANY is the largest of all the Chinese exhibitors.